I’m planning on this being my last “week in review” post, as my fiancé and I finally moved into our place and are no longer drifting homeless through Seattle. I also have oyster babies now, so the data collection can officially begin! Checked the buckets for larvae-did not see any. No dead broodstock. 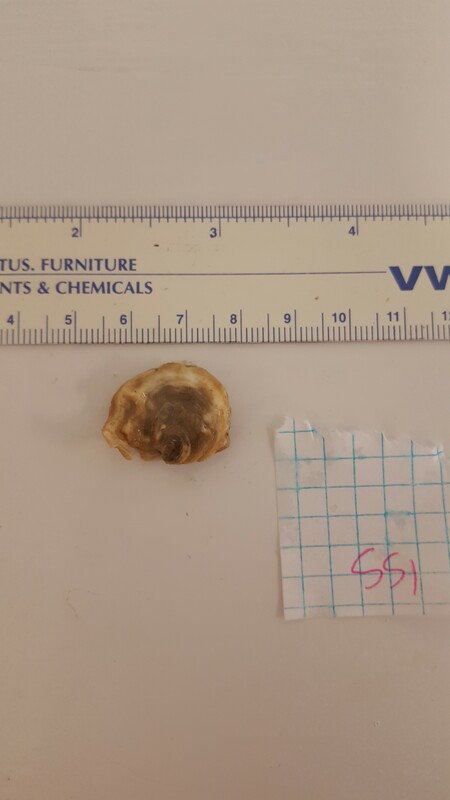 an oyster from a South Sound family (SS5) had fallen out of the bag and was in the bottom of the bucket while cleaning. May have been exposed to very dilute bleach. I put it back in the bag and will keep an eye on that family. Started taking pictures of the adults for size measurements in Image J. To do this, I take one family at a time out of it’s bucket and gently take the oysters out of the bag. An oyster is placed next to a ruler and I took pictures of dorsal/ventral sides using my Galaxy S6 phone (which should be more than adequate quality). I’ll load these on to Dropbox and put the link here this weekend. Ryan helped me get out the six 100 L larvae tanks and showed me how to set them up and clean them once I start getting larvae. Checked the buckets for larvae. Saw little black specs in HC2 so filtered them out over a 240 micron mesh screen onto a 100 micron screen. Sure enough they were larvae! I felt a little bit like a chicken with its head cut off- running around trying to remember what to do and figure out the best order for all the cleaning tasks so that no one was out of the water or crowded together for too long. There was a big spawn going on for another experiment, so I wasn’t able to take a larval count. I filled up a 100 L tank and put the HC2 larvae in there, planning on counting them on Friday. Filter out any newly spawned larvae from the buckets. Leave them in a tripour, mixing frequently. Clean out the broodstock and larval catch buckets. While those are refilling, do the larvae counts. Pour the larvae in the appropriate 100 L tank after counting. SS1 and SS3 had noticeable larvae in the broodstock buckets only. They were lighter in color than the HC2 larvae, which has been observed previously in South Sound oysters. Filtered them out over 240/100 micron screens and put them in 700 mL of seawater in separate tripour containers. Emptied out the HC 100 L larvae tank onto a 100 micron screen and put those larvae in a separate tripour with 800 mL seawater. Cleaned the broodstock/larval catch buckets and filled up two 100 L tanks. To count larvae, I mix up the tripour with the larvae, take four replicates of 1 mL samples and put them each in a clear well plate. I then count these under a microscope. After I had finished counting, someone recommended that I put a little ethanol on them 1st to keep them from swimming around. I’ll do this from now on, as trying to keep track of which ones I’ve already counted while they were swimming might explain the variance in my counts. This entry was posted in Blog, Lab Notebook by ksil91. Bookmark the permalink.